Got spiders? SpiderGuard is the answer. It is estimated that about 75% of humans are bothered by spiders in some way. AND there are approximately 3,400 species of spiders living in North America alone! 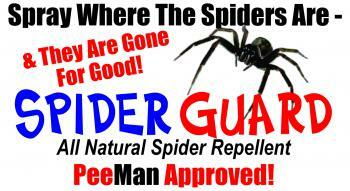 NEW SpiderGuard all-natural spider spray is an effective way to get rid of spiders for good. Just spray the areas where you don’t want them once a week until your spider problem is gone. SpiderGuard all-natural spider repellent spray is safe for use inside and outside and will not harm pets. This home spider repellent is PeeMan Approved. The unique formula in SpiderGuard takes advantage of the special bristles spiders have on their legs that allow them to taste and smell. They just don’t like it and they want to get far away! Use this natural spider repellent spray in attics, basements, sheds, decks, docks, boats, and anywhere else you don’t want spiders. 16 oz bottle with easy to use sprayer. Spray directly and liberally in areas with unwanted spiders to get rid of them for good! Reapply weekly until your spider problem is gone. All natural. Safe for use around pets.